Steven was born in Charleston, West Virginia into and Air Force family and is proud to be called a military brat. He traveled the country and the world following his father during his career as an Air Force Sergeant. He graduated from the United States Naval Academy on June 5, 1974 having majored in math and was selected for the Navy Nuclear Power program following a successful interview with Admiral Rickover. He earned his gold dolphins aboard the USS Los Angeles (SSN-688) which was the lead ship in the Navy’s fleet of attack submarines. He served on operational deployments to the Mediterranean Sea, as well as the Atlantic, Pacific, and Indian Oceans with stops in Spain, Italy, Bahama, Virgin Islands, Panama Canal, Pearl Harbor, Guam, Philippines, Mauritius, and even beautiful, downtown Diego Garcia. His civilian career involved safety and risk evaluations of nuclear power plants for the Idaho National Laboratory (INL), the civilian nuclear power industry in the United States and Canada, and government service with the Nuclear Regulatory Commission staff. He obtained a master’s degree in electrical engineering via the GI Bill while working full time at the INL. He resides in Ashburn, Virginia in the suburbs of Washington, D.C. with his wife Barbara who has managed to put up with him for over 26 years. He has six children (including a set of triplets), five grandchildren and a 95-pound Rhodesian Ridgeback named Sunstone’s Jasiri (Jazz) who likes to hog most of the space on the bed. He is passionate about story-telling in general and the subject of leadership in particular. Steve believes that leaders are made, not born, and that teaching others how to lead is the most rewarding and vital occupation anyone can participate in. Steve can be reached any time at semcon@comcast.net to talk about leadership and swap sea stories. Of course, you must understand the difference between sea stories and fairy tales. Fairy tales all begin with “Once upon a time” while sea stories always begin with “This is no BS.” After that, they are identical. “The Power of 3, Lessons in Leadership” is a concept of leadership based on principles organized in groups of 3 and depicted in the Power of 3 diagram. The concepts represent a complete picture of what leaders do. Every activity you may engage in while leading is addressed in one or more of these areas. There are 3 levels of leadership activities – foundation, challenges, and achievement. 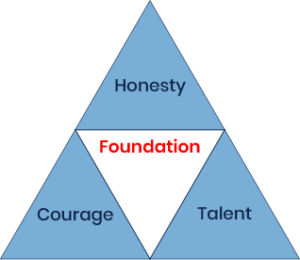 Foundation is the capabilities needed by all leaders to be effective meeting challenges and achieving success. It consists of Honesty, Courage, and Talent. Deficiencies in any of these three will eventually produce significant failures in leadership while strengths in these three provide the basis for handling the challenges and enabling achievement to occur. And interestingly, most education, training, and schooling is focused on improving talent even though talent is the least important of the three for avoiding catastrophic leadership failure. Challenges are three areas where difficulties will always arise that leaders must be able to navigate. These are Missed Expectations, Ethical Conflicts, and Despair. Missed Expectations are simple to understand but hard to deal with. They always involve 3 issues - What was expected, How was expected to be done, and did people want to do it (Wanna)? The leader is primarily responsible for What and How, the follower is responsible for Wanna. Leaders who jump to Wanna without checking their role in What and How will not be leaders for long. Conflicts have three potential solutions – fix it, accept it, or leave it. The fourth option – do none of the three but hang around and complain about it - is too often the option of choice. Leaders need to eliminate option 4. Despair is both and personal and an organization condition that prevents people from acting for the benefit of others. Driving Despair Out is a critical challenge for leaders. 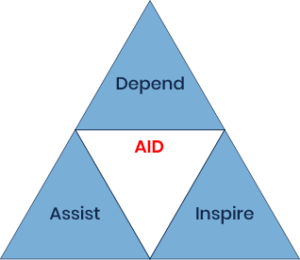 Achievement occurs when the leader implements AID – Assist, Inspire, and Depend. Since leaders have followers because they cannot do everything themselves, the more they assist others achieve their goals, the better the organization will achieve. The more leaders inspire their followers, the more likely they are to achieve. And most importantly, leaders need to depend on others because without them no one achieves. A leader who does not trust their followers cannot depend on them. Micromanagement, and overbearing involvement are sure signs of a leader who cannot depend on their followers.